The possibility of a Park and Ride scheme in Harrogate to ease the town's traffic nightmare has split the opinion of residents. During a meeting of Harrogate's Chamber of Trade on Monday, November 2, the possibility of introducing a scheme similar to one in York was discussed. However, Coun Don Mackenzie, North Yorkshire County Council's Executive Member for Highways, warned residents that, if the scheme was brought in, they would have to be braced for a tax increase. With the state of the town's traffic a particularly sensitive and divisive issue at the moment, many residents took to the Harrogate Advertiser's Facebook page to have their say. Some residents, including David Stanton, Anthony Windross and Elizabeth Conning spoke in favour of introducing a Park and Ride scheme, believing it to be a more positive measure than building a Western bypass. Elizabeth said: "Surely a bypass would have a detrimental effect, no cars, no trade, most people hate hunting for parking places. Maybe park and ride would help?" However, other residents were concerned about the actual benefits of introducing the scheme, especially considering the added cost to the tax payer. Graham Richards said: "So let me get this straight. HBC/NYCC want to charge us to park evenings and Sundays; charge us to empty the brown recycling bins and now tax us if they provide a park and ride? "Surely the Park & Ride will serve people living outside Harrogate, rather than local residents? That doesn't seem fair at all..."
Debbie Bayes said: "Wouldn't use it anyway so don't want to pay more tax on top of the massive amount I pay already for not really very much being that I live in the sticks!" Michala Dennis: said: "You think a park and ride would help solve the horrendous traffic of Skipton/Wetherby road? Call me stupid but that traffic is passing through harrogate not shopping." Cyndy Ramsden was also adamant that the scheme wasn't wanted, while Liz India Johnson stated that residents in Harrogate 'pay over the odds already'. 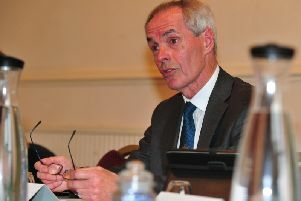 During the meeting, Chief Executive of the Chamber, Brian Dunsby, raised his own suggestion to easing the congestion by scrapping the town's traffic lights in favour of roundabouts. This idea seemed the most supported by Harrogate residents commenting on the Advertiser's Facebook page, including Catherine Mounsey and John Brown. Liz Carnell said: "It's a traffic light problem. Change timing or get rid and have mini roundabouts in Skipton Rd. Surprised the Gt Yorkshire Showground hasn't applied for a park and ride up there. Would bring in revenue at a time the land is unused." Stuart Et Floyd Rhodes said: "The town needs a bypass, better traffic light systems and a cashless parking system. The managers of Harrogate have once again proved themselves to be incompetent."